Put your ear to the ground and you’ll hear it: a swell of conversation from chief medical information officers (CMIOs) and other healthcare executives about interoperability and data sharing between acute and ambulatory care facilities. Listen a little longer and you’ll also hear the swell across the parking lot between hospitals and physician offices. The talks are increasing because integrating patient data among facilities (hospitals, clinics, labs, physician practices, etc) is becoming a top priority. Executives know that interoperability across the healthcare spectrum delivers significant benefits, with the primary goal being increased patient safety and better care. These leaders also understand that using accurate patient data integration via an enterprise master patient index (EMPI) solution to meet this goal also provides additional benefits. By reducing duplicate registrations and creating real-time links between patient records at both acute and ambulatory facilities, an EMPI can simultaneously increase patient and physician satisfaction while potentially positively impacting the economics of operating a healthcare organization. With such strong motivators, why aren’t more organizations implementing solutions that allow patient data exchange between acute and ambulatory facilities? Many healthcare executives know that acute and ambulatory interoperability is the logical next step for the healthcare industry, but they also think that such a solution will either be cost or time prohibitive or too disruptive to the day-to-day operations of their existing technology infrastructure. Some have concerns that patient data can’t be shared privately or securely among groups that are not owned by the same entity, such as hospitals and private physician practices. The truth is that there are EMPI solutions that can be deployed quickly and efficiently—within a few months in some cases—without disrupting existing systems. Technologies exist today that allow executives to accomplish the safety, satisfaction, and revenue goals within their healthcare organizations—and even outside of their walled boundaries—while keeping data secure and meeting privacy regulations. CMIOs are even learning that implementing EMPI technologies doesn’t have to be as challenging as some have feared. Much like bank customers demand access to their account information from every touch point within the banking network, healthcare patients have the same expectations. Whether patients are at a hospital, a lab, or their primary care physician’s office, they expect their complete, end-to-end patient record to be available at the point of service. Focusing on data interoperability between acute and ambulatory facilities can dramatically improve patient satisfaction. Imagine the loyalty patients will feel toward a healthcare provider when visiting a specialist who is able to electronically and securely access complete care records from the primary care physician’s office. Patients can receive the care they need, when they need it, without frustration, inconvenience, or any additional stress that may impact their current illness. Convenient access to accurate and complete patient records may even spare them a redundant test and the associated expense. For large healthcare systems that own and operate both acute and ambulatory care facilities, the expectation of providing integrated patient data is even higher, leaving some organizations struggling to meet patient demands. In some cases, the healthcare system is already marketing itself as a caring member of the community that knows the residents personally, but its patient data are in silos and unavailable to caregivers at the branded imaging centers, affiliated physicians’ offices, or hospitals that are only a few miles apart. Patients walk away baffled that they have to repeatedly recite their personal information at multiple facilities owned by the same company. When data are safely and securely integrated or exchanged within and outside a delivery network, patient satisfaction can be markedly improved, and customers are more easily retained. In addition to happy patients, healthcare organizations must also focus on maintaining satisfied physicians. The industry is approaching an era in which finding and retaining skilled resources (specialists, technicians, and primary care physicians) is increasingly difficult. These organizations must respond by being more attentive to physician satisfaction, so they can avoid having doctors switch their primary point of practice and affiliations. Exchanging patient data between acute and ambulatory care facilities may be one way that healthcare organizations can maintain high physician satisfaction levels. For starters, shared patient data help physicians keep their own patient satisfaction levels high and reduce turnover in their patient base. Breaking down the walls between physician practices and hospitals to create an interoperable environment allows physicians and their staffs to more efficiently treat patients and provide better overall care. In addition, when doctors have secure, timely access to complete patient records, patient safety is often improved and costs are reduced. It makes sense—more efficient doctors and care staffs can see more patients in a given day, generating more revenue. In the course of an average day, doctors waste a lot of time just trying to find relevant patient documentation. Integrated data could improve this situation, providing physicians with more time to interact with patients and enabling them to see more patients per day. Accurate and accessible patient data can also reduce the number of duplicate tests ordered by physicians, which decreases costs for everyone involved. Large numbers of expensive and redundant tests frequently take place simply because the results of previous tests are unavailable to the physician in a timely manner. With linked patient records, physicians are able to quickly view test results from anywhere, eliminating the need to order repeat tests that escalate costs and potentially compromise patient safety through unnecessary needle sticks or repeat radiation exposure. When evaluating EMPI technology options to address data interoperability, healthcare executives should look for a federated solution that offers robust privacy and security controls and can be implemented rapidly and cost-effectively without disrupting their existing IT infrastructure and data ownership. 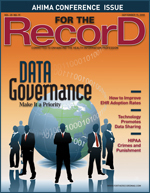 A federated EMPI solution, which does not require existing data to be physically moved, can create an organizationwide master index of patients and record locations from existing systems such as McKesson, Epic, Allscripts, and Siemens and provide real-time data sharing while allowing the hospital, clinic, or physician’s practice to retain ownership and control of its own data. Since a federated EMPI solution delivers only the information needed for any given patient interaction, security and privacy benefit. In that vein, CMIOs and other executives should be on the lookout for an EMPI solution that supports highly granular policy controls ensuring that only authorized personnel have access to patient information. EMPI offerings that integrate patient data beyond the hospital or clinic walls are now available—solutions that are faster, less expensive, and more secure than many think. This technology can serve as the foundation for helping patients receive the highest quality care possible and ensuring that they are treated as valued customers while addressing physician satisfaction concerns and promoting more cost-effective care. At the end of the day, patients can receive better care for less expense. Shouldn’t that be everyone’s goal? — Lorraine Fernandes, RHIA, vice president and ambassador of Initiate Systems’ Healthcare Practice, is a nationally known expert on electronic health records. In addition, she serves on committees and workgroups for HIMSS, the AHIMA, eHealth Initiatives, and the National Alliance for Health Information Technology.